Administrator McCarthy thanks law students for caring about public health issues. During her question-and-answer session, Administrator McCarthy explained that environmental challenges are intertwined with economic choices. 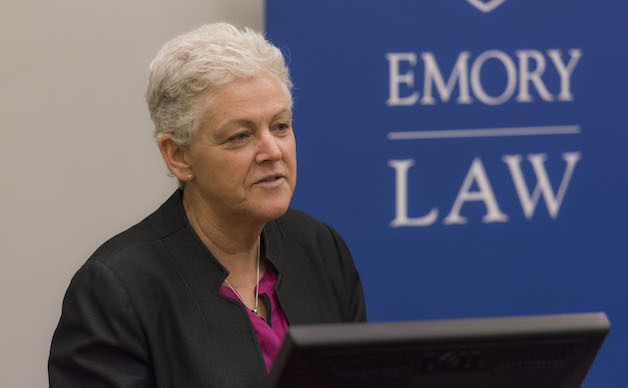 “We have to stop segregating the two in our discussions,” she said, adding that what the EPA does is not simply environmental work, but also fundamental public health work. There are many more illnesses from non-communicable diseases today than in the past, she suggested, noting that clean air and water affect many of those illnesses, asthma among those she mentioned. “If you cannot breathe and your kids cannot go to school, you cannot climb the economic ladder,” McCarthy said. Gwen Keyes Fleming 93L, McCarthy’s chief of staff, arranged the administrator’s visit through the Turner Environmental Law Clinic. Before visiting the law school, McCarthy toured the campus and visited WaterHub, the wastewater treatment facility that helps Emory reclaim some 300,000 gallons of campus wastewater daily. “If you haven’t been to visit WaterHub,” she said, “you have to go by. “ The facility adheres to a principle McCarthy said the EPA holds high: “The EPA has to operate under the assumption that nothing is a waste. We have to return to the natural world to design the systems that will provide clean air and water fixes for us all. During her visit, Administrator McCarthy encouraged law students to become more involved and vocal in crafting the legislation that determines how our air and water are regulated. It’s unrealistic to think that people can change the world overnight, she said; but, using what’s legally available and doable, necessary changes can be made.